Known as a "Small Town with a Big View" - Orting provides quick access to the Puyallup and Carbon Rivers, biking and hiking trails, picnic areas, playground, restaurants, shops, Mt. Rainier, and a quaint area to discover. EBT/Debit/Credit are accepted at the market! Classes, demonstrations, and entertainment are always FREE! The Orting Valley Farmers Market is limited to Washington State Products and Pacific NW Seafood in order to support our local agriculture and economy. 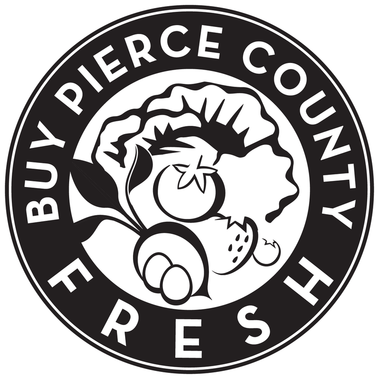 Our mission is to provide local small farmers with a promoted and managed venue to sell their products; to promote the preservation of local farmland; to provide healthy local food to the community; and to provide material support to the Orting food bank. The Orting Valley Farmers Market is a 501(c)3 non-profit organization with an active board of volunteers. We are currently filling vacancies on our board! Please contact us if you are interested in helping our market grow and succeed!